The spine of a golfer is very susceptible to injury. One of the most common complaints from golfers is pain in the lower back. The mechanics of the golf swing place stress on the parts of the spine including the joints, muscles, tendons and ligaments. According to the University of Pittsburgh Neuromuscular Research Laboratory, "more than 30 percent of golfers have experienced issues related to low-back pain or injury that have affected their ability to continue enjoying the game of golf." The repetitive movement of the golf swing is one of the factors that causes back pain in golfers. During the golf swing, the back is put into an unnatural position in which the weight of the body is shifted, the spine is torqued and the weight of the club is placed over the shoulders and behind the neck. This position puts the back under stress and leads to pain and injury. Muscles become tight, thus pulling on other muscles and bones around them. Many golfers choose to carry their own golf bags while on the course. This makes the game a better workout, but it adds more stress to the lower back. Golf bags vary in weight based on their contents, but on average, a golf bag weighs between 20 lbs. and 35 lbs. The bags are sometimes carried over one shoulder, leading to the transfer of weight down one side of the body to the lower back. If back pain is an issue, pulling a bag, carting a bag or having someone else carry the bag may be necessary. One of the best ways golfers can prevent lower back pain is to participate in a golf-specific fitness program. These focus on the muscles of the body that are used in the golf swing, particularly the core--the area from the shoulders to the knees. Abdominals, back and buttocks should be the main focus of core training. These muscles brace and protect the bones of the spine and generate the power needed in a golf swing. The stronger these muscles, the less taxing the golf swing is going to be on the rest of the body. Flexibility is also important, as it improves range of motion. By improving flexibility, particularly in the hamstrings, a golfer can move through the positions of a swing more easily and with less pain. Living with back pain can be frustrating and tiresome, however there are several treatments options. First, warm up the muscles prior to any golf game. Increased blood and oxygen flow to the muscles prepares them for activity. After play, icing painful areas of the back will help decrease inflammation. Finally, massage the muscles to keep them loose. If lower back pain persists or grows worse, golfers should seek medical attention. 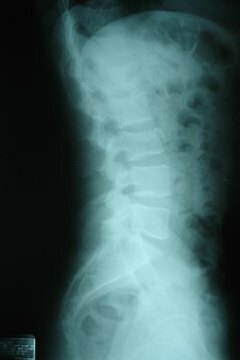 Chiropractors and orthopedics are two types of doctors who work with spinal issues. They can prescribe plans to help with pain and heal any injuries that may have occurred. This can become expensive if X-ray and MRI images or physical therapy are necessary.